About 15% of couples, who want to start a family, encounter a problem in conceiving a baby; the cause of that problem can lay both in the woman’s as well as the men’s infertility. It was not so long ago, that childless couples were completely shut out from hope of ever having children. However, today, thanks to the latest discoveries and medical achievements, many of the infertility problems are being successfully solved. The high technological methods of modern diagnostics and treatments for infertility make it possible for many couples to overcome the problems of infertility and live out their dreams. The IVF center at Chaim Sheba Medical Center is the leading center for IVF treatment in Israel and one of the best medical centers in the world for successfully treating problems of infertility. Every since the foundation of the IVF center, its staff members, on numerous occasions had become the initiators for new achievements in the field of IVF in Israel. 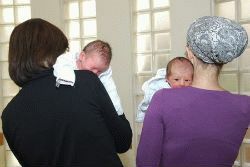 The IVF center at the Chaim Sheba Medical Center uses the most up to date effective technologies and techniques for treating infertility problems. The Chaim Sheba Medical Center had started the research in the field of In Vitro Fertilization (IVF) back in the early 1980’s. In September of 1982 success arrived: The first “lab baby girl” in Israel was born. Today, the IVF center at the Chaim Sheba Medical Center is one of the leading infertility treatment centers in the world. In 2005, the Chaim Sheba Medical Center succeeded in initiating the first (in the world!) pregnancy, using an ovary tissue, which was frozen at an earlier time. Nowadays the IVF department at Chaim Sheba Medical Center uses unique techniques, recognized world wide, which have proven their effectiveness over and over again in conducted clinical research. Thus, the statistics for IVF in Israel reveal 35% of successful pregnancies by means of fertilization of fresh egg-cells and 21% of successful pregnancies using defrosted egg-cells. The percentage of successful pregnancies among women in their forty’s had reach a number as high as 15%. The medical staff at the IVF department uses the most up to date computer programs and other technologies for the processing of tests’ and procedures’ results, as well as monitoring the patients during the entire pregnancy period. For the purpose of achieving better results, the IVF department is working in close cooperation with the department of mail reproductive medicine. The team approach towards the treatment of infertility combined with wide lab possibilities and special programs bring about the high percentage of positive results in the treatments of infertility, even when dealing with difficult cases, which were considered hopeless not so long ago. The department consists of 12 doctors, as well as nurses, embryologists, specialists in the field of ultrasound equipment and technologies, and psychotherapists. All of the IVF medical staff members pose a group of professional experts in the fields of embryology, andrology, immunology, gynecology, genetics, reproductive endocrinology, urology and other related fields of medicine. Professor Moshe Fridman, the Head of the clinical service at the institute of genetics, together with his colleagues, offer genetic consultation service to couples before they enter into marriage; they also perform prenatal and postnatal diagnostics of genetic diseases. The members of the IVF medical staff are authors of hundreds of research articles in the field of reproductive medicine, which were published in the world leading medical issues. The department’s medical staff regularly participates in national and international conferences and symposiums. IVF treatments have been developing in Israel for over thirty years now – since the very moment when this revolutionary method had been invented. With the help of IVF millions of women around the world, who in earlier times were considered to be infertile, were able experience the happiness of motherhood. The techniques of medically assisted procreation are constantly progressing. With the implementation of modern technologies and new clinical instruments, doctors can now perform not only diagnostics of hereditary chromosome diseases and the embryos’ congenital abnormalities, but also improve the chances of a successful outcome for IVF attempts. Statistics show that the percentage of successful impregnations with the help of IVF treatment in Israel is higher than the percentage of successful impregnations with the help of IVF treatment in any other country in the world and much higher than the percentage of successful natural impregnations. In the past it was mistakably considered that the performing of a hormonal stimulation before extracting the egg-cells leads to a higher risk of oncology diseases of the female reproductive organs. Today it has been proven that women, who got pregnant with the help of an IVF treatment, are by 25% less likely to encounter ovarian, breast or uterus cancer than women who never used IVF, and were getting pregnant in a natural way. However, the modern tendency is such, that the ovarian stimulation for the performing of the IVF procedure is much less aggressive. The new MNC-IVF and MS IVF procedures provide a smooth stimulation with a minimum impact on the women’s natural cycle. These techniques are especially recommended for women, who had breast cancer or suffered from ovarian hyper stimulation syndrome in the past, or those who had an unsuccessful IVF attempt due to lack of tolerability or apparent side affects to the implementation of medicaments within a full scale stimulation. The longstanding Jewish tradition of a multi-child family, government funding, high level of experts’ knowledge and experience in the field of fertilization had without a doubt placed Israel on a world wide leading position in the field of infertility treatments. About 18000 couples in Israel go through IVF treatment; this number exceeds by much the IVF procedures which are held in most other countries in the world.